Each neuron can form synapses (connections) with up to 10,000 other neurons in an incredibly complex system. Nerve impulses can on the way pass one billion billion synapses. With these synapses and the circuts the memory will be storred. The memory capacity of the brain is today estimated to be between 1 and 1000 terabytes. 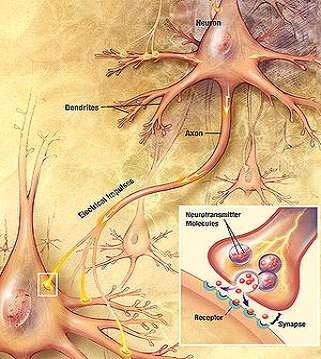 The nerve impulse is electric and runs along the outside of the cell membrane, but when this impulse arrives at the synapse, then it is mediated by small molecules, neurotransmitter. See picture. When you learn something at least 50 million synapses per second are formed, according to what I read earlier. Recent research on the brain and genetics of this shows that humans have a superior ability to form synapses compared to other primates. This is by strengthening the best synapses and eliminate the less good synapses. Real efficiency. The top of the gene activity behind the synapses is reached at five years in humans, unlike chimpanzees who reaches this at one year. "Our findings suggest that the human brain is extremely plastic and sensitive to environmental impact during the first five years of life," said one nerve cells and brainresearcher named Khaitovich. "Our study revealed a potentially important mechanisms involved in the early development of human cognition." The research on nerve cells has also shown that a nerve cell must have the same impulse at least four times to form permanent synapses for memory to become what we call long-term memory and it requires many synapses to form a memory. For the brain to learn things good brain must get many impulses. We need practice, practice and practice again for the brain. To be really good at something about 10,000 hours of practice are needed. With this knowledge, I understand Kairos Future's observation that brain research and pedagogics does not speak the same language, does not speak to each other. Homework and practice through training and re-training is not so popular. Students would like to find a shortcut that does not exist. Some schools like to highlight specific pedagogies to attract students. The first students ask about today at the school information about it on the natural science program if it is much homework. Studnets before would never have dreamed of that question. We usually respond a bit vague. If we start talk about this info that the school should follow the latest brain research and that there is much homework and exercises it would not be popular. But so it is. Besides the teacher has to create a good environment for learning and Kairos Future has recieved the usual description from the students of a good teacher. He should be knowledgeable and committed, have humor but at the same time be strict and fair, that is able to keep track and order. Various studies have shown that successful teachers are knowledgeable, passionate about their subjects, are interested in their students, thus engaged. What type of pedagogics used plays a minor role. Obviously using IT-technology is increasingly important today. But the personal knowledgeable and commitment is still as important. With this, Kairos Future pinpointed out a weak point.